According to authority a well preserved ancient tomb of a priest Wahtye, has been excavated which dates back to over 4,400 years in the pyramid area of Saqqara, south of the Egyptian capital of Cairo capital. Saqqara had been the burial ground for Memphis the capital of ancient Egypt for over two millennia. To preserve their bodies for afterlife, the ancient Egyptians had preserved humans while the animal mummies had been utilised as religious offerings. The tomb is said to be adorned with symbols and statues which has led the archaeologists to investigate the site further, for more findings. 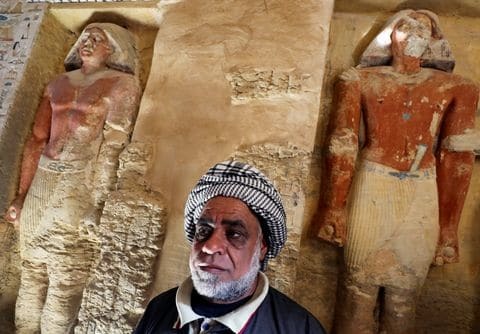 According to Reuters, Mostafa Waziri, secretary General of the Supreme Council of Antiquities, had informed reporters at the site that the tomb was discovered buried in a crest which had been intact and unharmed. The excavation as per New York Times had started since November. According to his description, he had stated it as `one of a kind in the last decades’. The tomb belonged to a period during the rule of Neferirkare Kakai, who was the 3rd king of the Fifth Dynasty of the Old Kingdom.The name of the departed, hieroglyphs engraved in the stone over the door of the tomb reveals the title, royal purification priest, royal supervisor together with inspector of the sacred boat. The tomb had only been partially unearthed and the archaeologists are anticipating more finding on excavating the site further. A last layer of debris had been removed from the tomb by the archaeologist who discovered five shafts within. On examination, it was found that one of the shafts was unsealed with nothing in it. However the other four had been sealed and more discoveries were anticipated on uncovering the shafts. The rectangular gallery of the tomb is said to be ten metres long, thirty three metres wide and less than three metres high. It is covered in painted reliefs, sculptures together with inscriptions. Waziri had stated that the tomb is unique due to its statues and its almost flawless condition.Itportrays Wahtye together with his wife, Weret Ptah, his mother Merit Meen and the daily scenes comprising of hunting, making offerings, sailing and developing goods like pottery and obituary furniture. One will find big painted statues of the priest and his family in 18 niches and 26 smaller niches towards the floor have statues of an unidentified person in a standing or seated position with his legs crossed. Besides this, the colour too is intact inspite of being 4,400 years old. Khaled al-Enany, Antiquities Minister had informed the audience of guests who had been invited inclusive of AFP reporters, that they would be announcing the latest discovery of 2018, a new discovery of a private tomb.An Egyptologist, Aidan Dodson at the University of Bristol had mentioned in an email that `what we have is a rock-cut tomb-chapel. What has been exposed so far is the public part of the complex, where family, friends and priests could come and leave offerings for the dead’. Dodsonwas not involved in this project. He had commented that the number as well as the variety of the statues seems unusual. He had also added that the rest of the decoration comprises of scenes intended to mystically construct an atmosphere for the next world especially the creation of food to sustain the dead for eternity and their acceptance of offerings. The Saqqara catacomb is also a home to the well-knownDjoser pyramid which is 4,600 years old structure that tends to overlook the site. It is considered to be the first tombstone of Egypt. The tomb had been erected by Imhotep, the master architect for Pharaoh Djoser which was 62 metres tall initially. It is said to be the oldest building in the world which is built completely of stone. The ancient tomb had been a very famous tourist attraction for years enticing visitors in indulging in rare glimpses of this amazing site which was inhabited by people living there thousands of years ago. Moreover it is also considered as a UNESCO World Heritage site and home to several other tombs. However inspite of its interesting site tourists have stopped visiting this country due to fear of violence created against the former Egyptian President, Hosni Mubarak. With the continuous political issues together with series of terrorists attacking tourist areas, international travellers have been discouraged from visiting this country. A dozen of ancient unearthinghas been done by Egypt during this year. With these discoveries, Egypt expects to enhance its image abroad, reviving interest among tourists. Tourists not long ago used to visit its iconic temples and pyramid but had refrained from visiting this country owing to the 2011 political revolution. Egypt has now made its contribution with its archaeological discoveries, to international media and diplomats with the hope of gaining more visitors in the country.